China's lunar probe Chang'e-5 will be delivered to the Wenchang launch site in August in preparation for its launch by a heavy-lift Long March 5 rocket in late November. Ye Peijian, a senior official involved in lunar exploration and attached to the China Academy of Space Technology (CAST), confirmed the move to China Central Television ahead of the country's annual parliamentary sessions in Beijing. The complex mission will involve a number of stages and components, involving lunar soft-landing, collecting samples, ascent from the Moon, a docking in lunar orbit, heading home and reentry into the Earth's atmosphere. The plan will be for operations on the Moon to take place within a lunar day, and the mission completed before the end of 2017, with a reentry capsule carrying up to 2kg of lunar regolith to a landing spot in Siziwang Banner in Inner Mongolia. The mission marks the final stage of the country's three-step lunar exploration project that has seen two orbiters and a lander and a rover explore the Moon. But new plans are already underway. Future lunar missions include the Chang'e-4 probe which will attempt the first ever landing on the lunar far side in late 2018, utilising the backup lander and rover from the Chang'e-3 mission. China will then target the north and south poles of the moon, Ye says, to undertake surface exploration, resource development and related technology validation. The lunar poles are of tremendous scientific interest and could offer new insights into the origins and evolution of the Earth-Moon system and the solar system itself, and could also be extremely useful in terms of resources and for future human outposts. 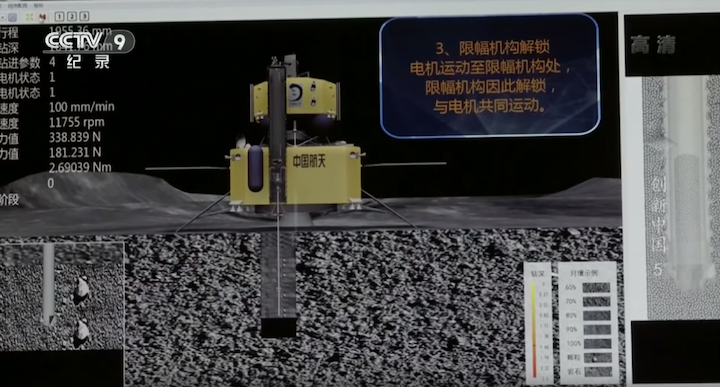 With the launch of the Chang'e-5 Moon sample return probe this November, China will complete its original three-step programme to separately orbit, land on, and collect materials from the Moon. But the country's ambitions won't stop there, according to Ye Peijian, a chief commander of the China Lunar Exploration Project (CLEP). Ye told media on Wednesday that the pioneering Chang'e-4mission to the lunar far side in late 2018 - utilising the backup lander and rover from the Chang'e-3 mission - will kick off a brand new fourth phase of exploration. More immediately the Chang'e-5 probe will be shipped to the Wenchang Satellite Launch Centre on Hainan island in August in preparation for launch on a Long March 5 rocket in late November. Above: The Chang'e-5 reentry capsule (Framegrab/CCTV). The mission will feature China's first automated moon surface sampling, and the first such mission by any country for over 40 years. 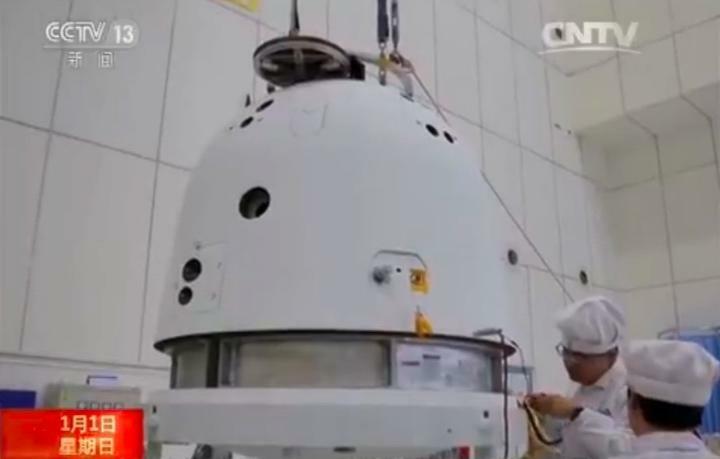 Should Chang'e-4 and Chang'e-5 be successful, the backup sample return probe Chang'e-6 is expected, though not officially approved, to attempt a sample return from the far side, possibly around the lunar polar regions. Such plans were noted in the Chinese government's space policy 'white paper' released in December. Chinese space-monitoring ship Yuanwang-3 has completed a 27-day maritime calibration mission and returned to port in east China's Jiangsu Province Thursday. The ship will take part in six maritime space monitoring missions as a part of the space expeditions scheduled for the second half of the year, which will include the launch of the Chang'e-5 lunar probe and BeiDou-3 satellite. Yuanwang-3 has embarked on more than 40 expeditions in the Pacific, Indian and Atlantic oceans, sailing more than 580,000 nautical miles. Apart from the missions assigned to Yuanwang-3, Yuanwang series vessels will carry out a total of 16 maritime space monitoring missions in the latter half of this year. The Yuanwang-1 and Yuanwang-2 ships were China's first-generation space tracking vessels, which first entered service in late 1970s, making China the fourth country to master space tracking technology after the United States, Russia and France. China is planning to launch its ambitious lunar sample return mission, Chang'e-5, in 2019, once the required Long March 5 heavy-lift rocket has successfully returned to flight. Pei Zhaoyu, deputy director of the Lunar Exploration and Space Program Center of the China National Space Administration (CNSA), told a space conference marking China's Space Day on Tuesday that the complex, four-part spacecraft will liftoff next year. 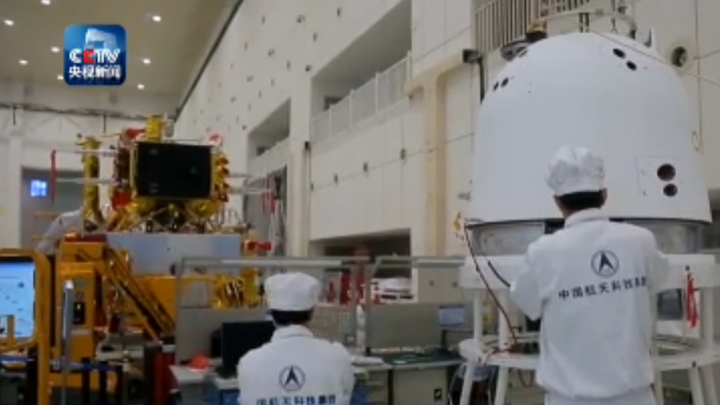 The Chang'e-5 spacecraft includes a service module, lander, ascent unit, and a return vehicle. After soft-landing on the Moon and collecting around 2 kilograms of samples, the ascent module will blast off into lunar orbit where it will need to dock with the service module, close to 400,000 kilometers away from Earth. The samples will be transferred from the ascent vehicle to the reentry capsule, which itself will separate from the service module a few thousand kilometres from Earth before reentry and landing in Siziwang Banner in Inner Mongolia. Chang'e-5 was due to launch in November 2017, but the failure last July of the second launch of the Long March 5, the heavy-lift launch vehicle required for the mission, has pushed the mission back. After isolating the cause of the failure and implementing a redesign of cryogenic YF-77 engines for the rocket's first stage, the third Long March 5 is set to launch around November. A nominal flight would clear the way for the fourth Long March 5 to launch Chang'e-5 from the Wenchang Satellite Launch Centre next year, as well as marking an important step for the Chinese Space Station project. The last lunar sample return mission, the Soviet Union's Luna 24 probe in 1976, saw the return capsule head directly back to Earth from the Moon's surface. The added complexity of Chang'e-5 in lunar rendezvous and docking suggests China is looking to gain experience for future lunar projects and Mars sample return missions, as well as potential crewed Moon landings in the 2030s. Preparations for the mission, including tests and simulations, have been taking place in Beijing at the China Academy of Space Technology (CAST), a developer and maker of satellites and spacecraft. China has already tested rendezvous and docking in low Earth orbit, with crewed and uncrewed Shenzhou spacecraft with the Tiangong-1 and Tiangong-2 spacecraft, as well as the Tianzhou-1 cargo vessel visiting the latter last year. Performing the feat in orbit around the Moon brings new challenges. The distances involved and speed of light means delays in sending messages to and from the Earth, thus requiring automation. The Chang'e-5 lander will set down near Mons Rümker in Oceanus Procellarum, a large area of lunar mare in the northwest region of the Moon. The selection of such a site means China could return the youngest lunar basaltic samples so far, with spectral analysis from Chandrayaan-1 Moon Mineralogy Mapper data indicating a surface age of around 1.33 billion years old. In contrast, the basalt samples collected by the Apollo missions were 3 to 4 billion years old. The mission will also be assisted with ground station support from the European Space Agency for launch and landing, and cooperation may also be extended to analysis of samples once back on Earth. China's current lunar program includes three phases: orbiting, landing, and returning. The first two phases have been accomplished, and the next step is to launch the Chang'e-5 probe to collect 2 kg of samples and bring them back to the earth, said Wu Weiren, an academician of the Chinese Academy of Engineering and chief designer of China's lunar exploration program. There are still many mysteries about the earth's nearest heavenly neighbor and future missions will be more exciting. The program will also promote China as a major player in space exploration. "We are discussing and drawing up the plan for the fourth phase of the lunar exploration program, including missions to the polar regions of the moon," Wu said. Some places at the south pole of the moon receive sunlight for over 180 consecutive days, and some areas in craters there are never exposed to sunlight and might hold frozen water, scientists say. "We hope to build a scientific research station in the south polar region of the moon. It would be operated automatically and visited by people for short periods," Wu envisioned. China is also planning to launch a probe in 2020 that would orbit, land and rove on Mars the following year. A heavy-lift carrier rocket, with a takeoff weight of about 4,000 tonnes and a diameter of 10 meters, is a goal for 2030. It would help realize the aim of bringing Mars samples back to the earth and sending Chinese astronauts to the moon. China is becoming a major player in lunar exploration, and contributing to scientific discovery. "Exploring the unknown is human nature. The moon is a mysterious world to us. We have a responsibility to explore and to understand it. 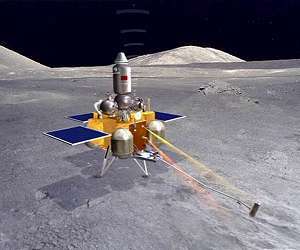 Exploration of the moon will also deepen our understanding of earth and ourselves," Wu said. China unveils on Tuesday more details about the Chang'e-5 probe, which will undergo multiple flight phases before the mission is completed. The probe, to be launched by the end of this year, will enter the Earth-moon transfer orbit. It will slow near the moon to enter the lunar orbit and descend and land on a pre-selected area for ground research work, including collecting lunar samples, said Peng Jing, deputy chief designer of the probe from the China Academy of Space Technology, at a press conference. After finishing its work on the moon, the ascender will rise from the lunar surface for rendezvous and docking with the orbiter flying around the moon. Then the returner will fly back to Earth via the Earth-moon transfer orbit, reenter the atmosphere and land at the Siziwang Banner (County) of Inner Mongolia Autonomous Region, Peng said. The lunar samples taken back by the Chang'e-5 probe will be sealed in a container and sent to labs for further analysis and research, he added. The probe can be divided into 15 sub-systems, including structure, thermal control, antenna, sample collecting and sealing and propulsion. It is composed of an orbiter, a returner, a lander and an ascender. The Chang'e-5 probe will be launched from Wenchang Space Launch Center in southern Hainan Province.